Remember my 21 Simple Romance Ideas? Even after almost 3 years, it’s still one of the highlights of my little blog. It seems I’m not the only one who believes romance is very necessary, but doesn’t have to be complicated. So, I’m back with another idea to help you ramp up the romance. This post contains affiliate links. I earn a little bit when you use them to shop. This shop has been compensated by Collective Bias, Inc. and its advertiser. My husband and I just celebrated our 21st anniversary and I’m certain we’re busier now than we’ve ever been. It makes it difficult to squeeze in those romantic gestures that seem to come naturally when you’re just starting out and we’ve learned that sometimes, you literally have to plan the romance. I had so much fun creating this printable Scavenger Hunt Kit for you and it’s so easy to use. Be sure to grab new printer ink before you get started. 12 Days of Romance Couple’s Scavenger Hunt with pre-printed clues, instructions and blank clue cards. Print and cut your scavenger hunt clues. If the clues don’t work for you, use the blank cards to create your own. You might also want to take this high-tech and simply text your clue each morning. Choose a date to start and a place to leave your clue each morning. Make sure it’s in a place they won’t miss. Shop! You can find everything you need for this at Target. Use my ideas below to spark your imagination, then buy twelve meaningful gifts to share with your sweetheart. There’s no need to break the bank on this. In this case, the thought really does count! Tell your spouse to expect some fun surprises and put your clue and gift out each morning. To make this work, you’ll need twelve small meaningful gifts. That might sound a bit overwhelming, so I have some suggestions. A sweet little love note telling your sweetie why you love him/her. Everything they’d need for a relaxing bubble bath (with or without a guest). K-Y® Yours+Mine® Couples Lubricants®, which you can find at Walmart. It might be something new for you, but don’t be afraid. A personalized playlist with songs that mean something to both of you or songs that tell a great love story. Burn this onto a CD or take the digital road. Something lacy in a little black box for him/her (or you!) to wear. A dinner by candlelight or a picnic by the fireplace. Print out a map showing the place where you met and put it in a frame. Buy personalized jewelry or another piece of jewelry he/she will enjoy. The one pictured can be personalized with any coordinates. Grab some very red lipstick. Whether you’re the girl giving it to your guy or the guy giving it to your girl, it means one thing…lots of kissing! 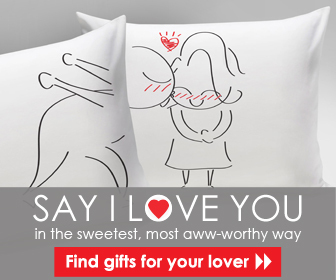 Get something new for the bed, like our couple’s pillow cases from Bodloft (pictured above). Something sweet for your honey to eat. Everything you need for a romantic massage. You can’t go wrong with this list or these printables! I’m certain they’ll help build intimacy in your marriage and I can’t wait to surprise my guy with these gifts. I’m looking forward to hearing how you use these ideas. Let’s chat about in the comments or on Facebook and Twitter!